Google+ Hangout vs Facebook Video Chat - Which One Is Better? Google+ Hangout vs Facebook Video Chat – Which One Has The Upper Hand Right Now? So by now we know that Facebook has got a brand new video chat powered by Skype. That was the most important announcement in Facebook’s “awesome” announcement last night (or earlier today depending on where you are). 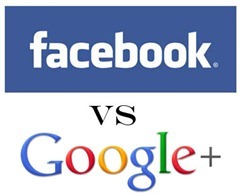 So, now we have the inevitable question - Google+ Hangout vs Facebook Video Chat – who will win? There are many things that we have to consider before making a call on this. First of all let us look at the number of users each platforms have. Facebook is much older than Google+ and Google+ is not yet fully open to the public. So, the number of users right now is not even comparable. Zuckerberg announced today that Facebook has 750 million users now. Google has not officially released the number of people on Google+, but it will be safe to say that it cannot be more than a million. So, Facebook’s product is available right now to a much larger audience. A larger audience, however, does not always means that the product will succeed. There is the matter of how easy it is to use and how well it works. Sure, all it takes to make a Facebook video chat or initiate a Google+ Hangout is just a few clicks. But, to me, it seems like Hangout is the more polished products. Everytime I used Google+ Hangout, it worked – that has nor always been the case with Facebook’s video chat. Once I received a video chat and on accepting it, the video chat never initiated and the call got terminated. In another case, I called a friend, he faced the same problem and cannot accept it. I disconnected it and when I try to call again, I get a message saying I can call only a person at a time – even though I was not on any call. Group Video Chat Is A Big Deal! And compared to Google+ Hangout, Facebook’s video chat lacks a very big feature – it does not have group video chatting capability. Zuckerberg tried to pass off this missing feature saying that group chat in Skype is seldom used. Well, unlike the one-on-one video chat which is free, Skype group video call is not free. So, obviously it has less users. Compare this to Hangout – it can support upto 10 people in a single video group chat and it is also intelligent enough to focus on whoever is speaking. This is the biggest advantage that Google+ Hangout has over Facebook video chat right now. And, also remember that Google+ also have one-on-one video chatting functionality through Gtalk. And for the Linux users, unsurprisingly Facebook group chat is not supported – it is powered by Skype after all. Google+ Hangout, on the other hand, works just fine on Linux. So right now, the only thing that Facebook video chat has over Google+ Hangout is the number of users. In every other aspects, Google+ Hangout is far better than it. With the interest that people have shown to Google+ and from my experience of using it, I am sure that Google+ too will get a huge number of users in no time once they open it up for everyone – Facebook’s advantage because of number will not last for long. Google Hangout is clearly the winner for now.